Dr.M.Ramesh, an Alumnus of this College obtained his Masters Degree from Sri Venkateswara University, Tirupathi, MPhil from Madhurai Kamaraj University and PhD from Acharya Nagarjuna University. 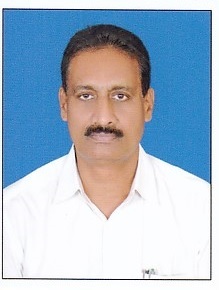 He began his career at P.B.Siddhartha College of Arts & Science, Vijayawada as a Lecturer in Economics. He assumed as Principal (I/C) of the College from August, 2016. Delivered a Lecture on “Oligopoly Market Conditions in India” in J.K.C.College, Guntur on 24-12-2010. Delivered a Lecture on “Inflation in India” in V.S.R. & N.V.R.College, Tenali on 07-02-2014. A Three Day International Seminar on “Poverty in the Contemporary World – Malady, Remedy” organised by the Center for Scientific Socialism, Acharya Nagarjuna University, Guntur District from 18th to 20th August 2011. XXXII Annual Conference of Andhra Pradesh Economic Association on 8th and 9th February, 2014 organized by the Department of Economics, Maris Stella College, Vijayawada. A Two Day National Seminar on “Agrarian Issues and Challenges in Andhra Pradesh” conducted by the Department of Economics, Acharya Nagarjuna University, Guntur District on 22nd and 23rd of March 2014. A Three Day District Level Training Programme on “A Foundation Course in Human Values and Professional Ethics” at S.R.R. & C.V.R. Govt.Degree College, Vijayawada from 25.08.2014 to 27.08.2014, organized by the Commissionerate of Collegiate Education, Andhra Pradesh. A One Day Workshop on UGC-XII Plan Guidelines held at Govt.College (A), Rajahmundry on 17.10.2014 organized by the Commissionerate of Collegiate Education, Andhra Pradesh. A Two Day National Seminar on “Innovations in Higher Education” organized by IQAC on 7th and 8th November, 2014 at P.B.Siddhartha College of Arts & Science, Vijayawada. A Two Day National Seminar on “Linking Agriculture with MGNREGA” organized by Department of Economics on 7th and 8th January, 2015 at J.K.C.College, Guntur. A UGC Sponsored National Seminar on “Socio-Economic Conditions of Marginalised Groups: A Search for Inclusive Policy” conducted on February 12 -13, 2015 at Andhra Loyola College, Vijayawada. A National Workshop on “Innovations in Curriculum, Teaching and Instruction for Teachers of Professional and Technical Institutions” on March 4 – 6, 2015 Organized by Centre for Education Beyond Curriculum (CEDBEC), Christ University, Bengaluru. A Two Day National Summit on Quality in Education, conducted by the CII and Institute of Quality, Bangalore on 22-23 September 2015. A Workshop on “Review, Evaluation and Action Plan for UGC Community Colleges and B.Voc. Centers for the States of Karnataka, Andhra Pradesh and Telangana” organized by Mount Carmel College (Autonomous), Bangalore on 29th September 2015. “UGC Sponsored One Week Faculty Development Programme (Multi Disciplinary Workshop)” from 17th to 23rd September, 2016 organized by Sri Subbaraya & Narayana College, Narasaraopet. An event in Economics, ‘ECON’ on 02.02.2015 for the students of Economics of other colleges in and around Vijayawada. One Day International Conference on Environment was organized by the Department of Economics in collaboration with Sri Ramanuja Mission Trust, Chennai on 23rd November, 2015 coinciding with UNO’s Paris Climate Change Conference in November, 2015. Prof.S.A.R.Prasanna Venkatachariar Chaturvedi Swami, Chairman, Sri Ramanuja Mission Trust delivered the key note address. The conference was chaired by the principal Dr.M.V.N.Padma Rao. Sri Gadde Rammohan Rao, MLA Vijayawada East Constituency, Sri Varadan Chandar Trustee, Sri Ramanuja Mission Trust, Ms.Kiran Bali, Chair Person, United Religions Initiative, UK, Sri Rama Krishna, MD, Efftronics, Sri Sridhar, Sri Ramanuja Mission Trust were the other participants of the conference. An event in Economics, ‘ECON’ on 12th December 2016 for the students of Economics of other colleges in and around Vijayawada. I.C.S.S.R. Sponsored National Seminar on ‘The Fourth Industrial Revolution – Impact on Business, Government and Society’ during 27-28 January 2017. A.P.S.C.H.E. Sponsored National Seminar on “New Education Policy – Goals and Imperatives” on 14-15 March 2017. Life Member of Andhra Pradesh Economic Association. Institutional Member, Computer Society of India (CSI), Vijayawada Chapter.